The Reserve Bank of India (RBI) in its fifth bi-monthly monetary policy review on Wednesday maintained status quo on rates and continued with its stance of calibrated tightening, but hinted at future policy easing. While the repo rate remains unchanged at 6.5 per cent, the reverse repo rate has been kept at 6.25 per cent. Though the rate decision was unanimous, Ravindra Dholakia of the six-member monetary policy committee (MPC) voted for a change in stance to ‘neutral.’ Addressing reporters, RBI governor Urjit Patel said if the consumer inflation (CPI) stays below 4 per cent on a durable basis, then a case can be made for reversal of stance to accommodative. “If upside risks to inflation don’t materialise, or stay muted, there is the possibility of space for commensurate action,” he said. The CPI estimate for H1FY20 was revised lower to 3.8 per cent from 4.2 per cent against 4.8 per cent earlier. Even as inflation projections have been revised downwards and some of the risks pointed out in the last resolution have been mitigated, especially of crude oil prices, several uncertainties still cloud the inflation outlook, RBI said. “Although recent food inflation prints have surprised on the downside and prices of petroleum products have softened considerably, it’s important to monitor their evolution closely and allow heightened short-term uncertainties to be resolved by incoming data,” said MPC statement. “First, prices of several food items are at unusually low levels and there is a risk of sudden reversal especially of volatile perishable items. Also, uncertainty continues about the exact impact of minimum support price (MSP) on inflation. The medium-term outlook for crude oil prices remains uncertain due to global demand conditions, geo-political tensions and decision of Opec that could impinge on supplies. Households’ one-year ahead inflation expectations remain elevated and unchanged. Risks of fiscal slippage exist at the Centre and/or states,” RBI said. In another decision, RBI issued final guidelines regarding stipulating a mandatory loan component in working capital finance for borrowers. With a view to promote greater credit discipline among working capital borrowers, RBI had earlier proposed to stipulate a minimum level of 'loan component' in fund-based working capital finance for larger borrowers and had issued draft guidelines. However, Karan Meh-rishi, lead economist at Acuité Ratings and Research, said RBI’s decision to hold rates at 6.5 per cent was largely driven by a challenging liquidity scenario and benign domestic inflationary conditions. “Nevertheless, we prefer to maintain an upward bias on our rate outlook since the combined CPI number is artificially deflated by lower food inflation figures. Also, the December 6 Opec meeting will be crucial as the members may consider constricting supplies in view of the falling oil prices. Additionally, there is a risk of the market misunderstanding the stance of the US Federal Reserve, which may not be in a position to hold rates longer. 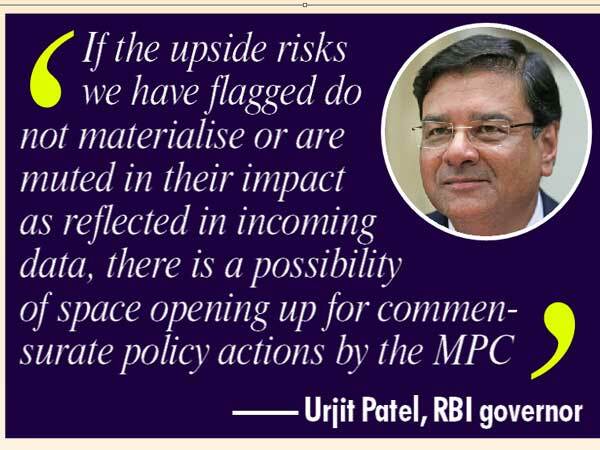 Collectively, these factors may not give RBI a long enough breather,” he said.